For Bryan Szweda, health and fitness are the essential keys to a happy lifestyle. Being successful with health and fitness begins with establishing the right diet. Even making small changes to your diet can lead to incredible results. When starting his new health and fitness plan however, Bryan Szweda found diet changes to be some of the toughest changes to make. After diagnosing his diet and earning his Sports Nutrition Certification, Bryan learned he needed to lower his calorie intake by reducing & eliminating processed and refined sugars and starches. These processed starches and sugars are categorized as “high glycemic”, meaning that they easily and quickly convert to glucose, resulting in an increase of insulin and fat storage. This increase of insulin production and fat storage results in higher levels of fatigue, which prevents Bryan Szweda from accomplishing his health and fitness goals. After eliminating the processed sugars, Bryan Szweda began to better balance his intake of proteins, fats, and carbohydrates. He began eating more vegetables, legumes, and whole grains such as rice, quinoa, and full oat oatmeal. He received his fat intake from a variety of healthy sources including nuts, avocados, and olive oil. For his protein intake, Bryan focused on low fat animal proteins including fish, chicken, and lean red meat such as venison, bison, or elk. Bryan Szweda also incorporated a multi-vitamin into his diet. He began eating smaller meals more often throughout the day rather than filling up on big meals and feeling lethargic. With a boost in energy from his new healthy diet, Bryan Szweda was able to focus on an improved exercise plan that would lead to a total body transformation. He focused his exercise routine largely around aerobic and resistance training. Working with a trainer, he ensured his workouts were giving him the maximum amount of fat loss. 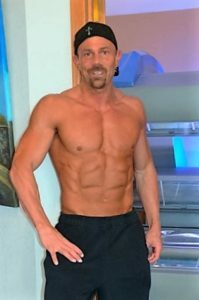 With his great success in the 90 day fitness challenge, Bryan Szweda felt healthy, fit, and confident to enter into a natural bodybuilding competition. Upon completing the fitness challenge, Bryan Szweda has made healthy eating and fitness a part of his everyday lifestyle. Even when traveling for his professional career, he has continued to stay healthy and eat clean whenever possible. While traveling all around the world to different countries has made this difficult, Bryan Szweda has taken on the challenge and done his research to understand which foods to look out for and which to avoid.